Home / News / Rescue Story / Lulu Hit by a Train and Survived! 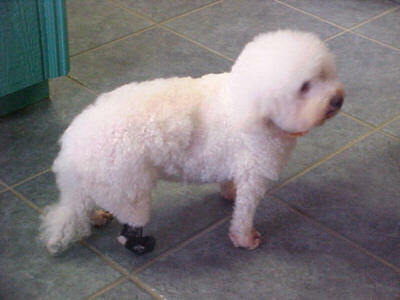 Lulu now RUNS on her prosthetic boot! 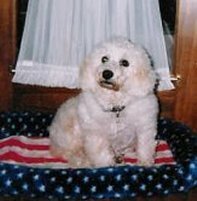 Lulu is an 8 year old Puppy Mill Rescued Bichons that got away from her new owners and was hit by what veterinarians believe was a train! 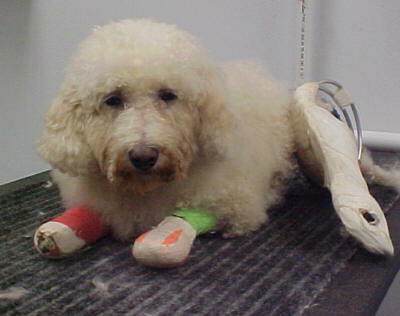 One of her paws was completely severed. This is the press release we will be sending out to the Ohio media! I met Sandy & Paul at LuLu’s vet appt this morning. She has to go weekly for a recheck & bandage changes on all 4 legs. Sandy might have a more in depth update but I just wanted to get these pictures to you of LuLu & sandy. Sandy & Paul are very attached to this girl already you can tell! And check out lulu’s new pink casts!!! 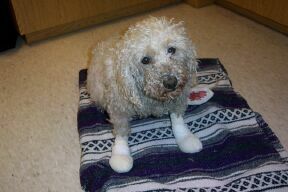 The Dr. told them that he couldnt have done a better job of keeping lulu dry & clean if they had cared for her themselves! And he’s right, they have done a super job. Sandy with Lulu at her one week after surgery check-up! The vet was VERY happy with Lulu’s progress! 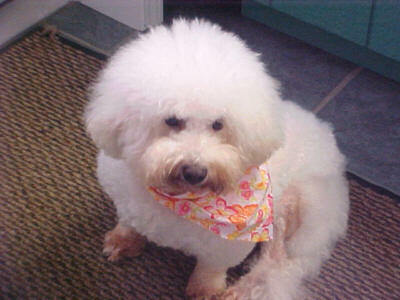 Lulu, an 8-year old Bichon Frise surrendered by a Tennessee puppy miller to Small Paws® Rescue, was hit by a train sometime on February 9, 2004 in New London, Ohio. Once afraid of human touch, Lulu had been placed in her forever home in New London by Small Paws® Rescue. Lulu was found by animal control and identified by her rabies tag. Tragically, her right rear leg was severed completely above the ankle. One of her front feet was fractured and missing toes. The other foot was also missing toes. Her left rear leg was “crushed like a bag of ice”, according to an attending veterinarian. Both the ankle and tibia were crushed. She also had open wounds on both of them. Immediate emergency medical attention was required to save Lulu’s life. Because the elderly couple that had adopted her was no longer able to care for her, they sadly had to return her to Small Paws® for treatment and rehabilitation. Knowing both the cost and commitment, Small Paws® made the decision in support of saving Lulu’s life rather than having her euthanized. Stable but in serious condition, Lulu was x-rayed to assess the damage done by the train. Miraculously, there were no internal injuries. However, her leg injuries were extremely serious. Doctors told Small Paws® the broken leg would never be straight and the severed leg would probably need to be amputated. The veterinarian’s notes read: “recommend orthopedic surgery or euthanasia”. But Small Paws® was determined that Lulu live. 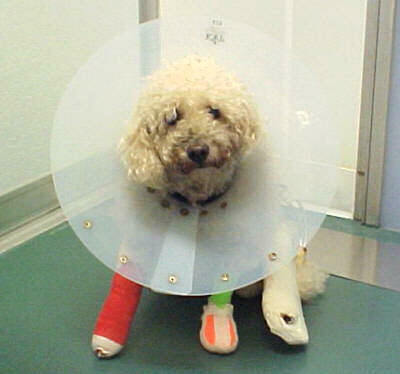 On February 10, 2004 the orthopedist examined and x-rayed Lulu and found that Lulu suffered some kind of “extreme trauma”. He could not rule out a train, saying that he could not think of anything else that could have done that much damage. In order to save the dying tissue and the severed leg, Lulu had emergency surgery, from which she successfully recovered. The surgeon said that if infection does not set in and the natural healing process is allowed to begin, Lulu has a 90% chance of a normal life. Lulu is now facing 3-4 months of physical therapy with her left rear leg to see if it can be saved. 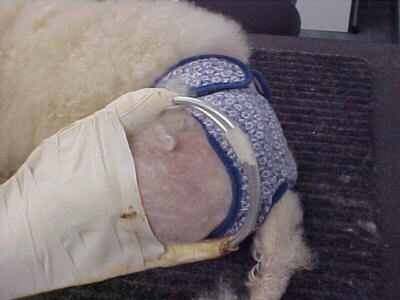 In the meantime, her right rear leg will not be amputated so she does not have to face life with two stumps and immobility without a cart, though she can still have an excellent quality of life if both legs need to be amputated. Although veterinarians were in agreement that Lulu be euthanized, Small Paws® Executive Director Robin Pressnall persuaded them to choose life for this loving girl. She relayed to them that Small Paws® Rescue has 6,000 members who support the decision to give Lulu a chance at a good quality of life – a second chance at life. Lulu is now recovering from her injuries and will be flown to California for rehabilitation in foster care. If you would like more information about this topic or to schedule an interview with Robin Pressnall, please call Robin at 918-638-5854 or email her at pup3@aol.com. Lulu is in the emergency room! Okay guys are you ready for this? Lulu no longer will be making the trip to Brookpark to see, “The Famous Dr. Ferguson, He released her on Thursday with flying colors!!! She showed him how she canwalk/run in her boot and how she uses her leg that was crushed so badly! Than he put a smiley face on her weight chart. She has went from 20.40 pounds down to 18.00 even. She needs to drop down to 14.00 pounds than keep her there. Dr. Ferguson spoke highly of Small Paws and how we all prayed and rallied together to save her blessed soul! God has a plan for Lulu, her time on earth is far from over! She could very well be a therapy dog for children or the elderly with disabilities. She could also be a Poster Dog for Small Paws Rescue to the many gatherings that take place each year! She may very well be staying here in Ohio, we are thinking about adopting her!!! Sending pictures of Lulu and Dr. Ferguson, Lulu sitting pretty and her showing off her “high fashion boot”!!! 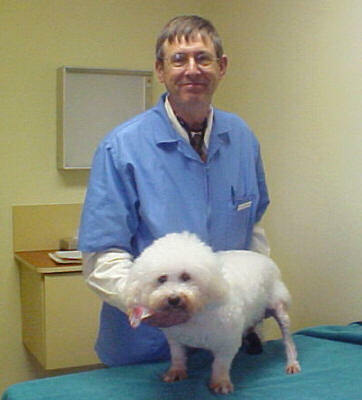 Dr. Ferguson, Orthopedic Surgeon Extraordinare with our Lulu…who is now standing on that leg that was crushed! Isn’t she just a doll! If you would like to help Lulu, this is how to do that! 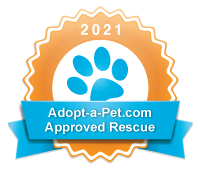 Click below to use your Discover, MasterCard, Visa or American Express Card to make a tax deductible donation OR to pay for a Small Paws Rescue adoption (adoption fees, airfare, health certificates and crates) on our SECURE Credit Card site. You also have the option of phoning it in as outlined below. You may also phone your credit card donation in to Janet at 508-717-1841. She is on Eastern Standard Time! Charge to your Credit or Bank Card a RECURRING MONTHLY Tax Deductible Donation. Fewer Checks to write each month! Authorize a Recurring Monthly Donation CLICK HERE! You may make a donation of any amount, just select the appropriate option. To make a ONE TIME DONATION of any amount, just select the appropriate option by clicking on the arrow on the right side of option box and highlighting amount you wish to donate.